Today’s special guest is Dusk Peterson and we’re chatting with about Dusk’s new alternate history novel, Sweet Blood (The Eternal Dungeon, Volume 5). 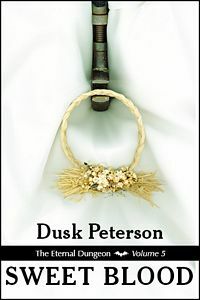 Honored in the Rainbow Awards, Dusk Peterson writes historical speculative fiction with diverse characters: historical fantasy, alternate history, and retrofuture science fiction. Friendship, romantic friendship, and romance often occur in the stories. I've just brought out Sweet Blood, the final volume in my Eternal Dungeon series, which is set in an alternative version of America that was settled in ancient times. As a result, ancient and medieval customs linger. The series is set in a royal dungeon that has gradually developed more humane methods of questioning prisoners. But younger prison-workers are now rebelling against the notion that torture should ever be used to question prisoners. In this climactic volume, the dungeon is torn apart by civil war, with lovers fighting against lovers, and friends turning against friends. The war becomes not merely a struggle to find a peaceful settlement over the issue of torture, but also a struggle to mend relationships. "Seven violations of the Code, Mr. Smith," said the Codifier. "Eight, if we count my own. All that our transgressions prove is that this dungeon desperately needs the Code and desperately needs leaders who are willing to take on the burden of punishing violations of the Code. If you and I were to resign today, who would take our places? Weldon Chapman, a man who barely escaped death for his own violation of the Code? Elsdon Taylor, who defied your orders to such a degree that his own senior night guard – a man of exemplary behavior until that time – took it into his head to loan his dagger to a mentally ill prisoner?" Layle's fists clenched, his automatic reaction to any attack on his love-mate. "Sir, I am to blame for Mr. Taylor's refusal to rack his prisoner. I did not sufficiently impress upon him—"
"Mr. Smith, I am not trying to apportion blame here. Mr. Taylor is a junior Seeker and has been working in the dungeon for only five years; it is natural for him to make mistakes. I am simply pointing out that there is currently no man in this dungeon who holds the qualities of leadership necessary to take over your position or mine during this crisis, should either of us resign or even receive temporary suspension from our duties." The Codifier carefully closed the Code of Seeking. Without looking Layle's way, he said, "It is the judgment of our Queen that we should remain at our posts, as we are needed here to deal with this crisis. It is also her judgment that we should continue our policy of requiring strict adherence to the Code. If any Seeker or guard violates the Code deliberately in the future, they will undergo discipline, just as Mr. Boyd did . . . but they will do so under my supervision of your actions." He was silent for a long while. He knew, from the heaviness in his chest, that he had hoped for a different outcome. Resignation from his post, temporary suspension from his duties, a retraction of the policy of disciplining any guard or Seeker who violated the Code in even the smallest way . . . Any of these changes would have relieved him of the pain of continuing to fight the junior members of the dungeon who opposed his policy – of continuing to fight Elsdon over matters that his love-mate could never fully understand, because he had never been a senior Seeker . . . and never would be, if he continued to defy the High Seeker. Oh, Mercy and Hell. He would gladly allow himself to be flayed for eternity if he could thereby escape the responsibility of disciplining Elsdon for any future violations of the Code. He could feel the Codifier's eye upon him. He forced himself to speak the words he knew must be spoken: "I am the Queen's servant." The Codifier slid the Code of Seeking into his desk drawer and rose to his feet. "If you were not, Mr. Smith, I would not have approved your appointment as High Seeker. Now let us put aside all thoughts of our own guilt and find a way to bring this dungeon back into order." When I started the series, I hadn't planned to overturn the characters' belief system; I was merely exploring how, even amidst evil, there can be people who strive to improve matters. The core of the series storyline has been the love that developed between the head of the dungeon (Layle Smith) and a former prisoner of his. But as time went on, I began to see how the differing views these two men held on how to treat prisoners would strain their relationship and begin to create a wider battle in the dungeon between two ideologies. When coming up with ideas for stories, I usually start with characters in a tense situation. But since I write historical speculative fiction, history inserts itself at a certain point. This period I'm writing about in the Eternal Dungeon series, the 1880s, happens to be when reformists were fighting for changes in American society, both in labor and in prisons. So that fit neatly with what was occurring to my characters. A young woman and a young man in a different time and place from each other are about to encounter the same problem, which will change their lives. Joktan is in trouble. Pursued by an unknown enemy, he must flee for safety . . . where? When his rash prayer transports him to a deceptively quiet town, he must make sense of the tremendous transformation he has undergone. Persis has spent nearly all her life on the Internet. A chatterbox online, she just can't seem to connect with people face-to-face. She had hoped that moving to a small town would give her a life beyond the screen, but she seems doomed to live alone forever. Then she rounds a corner and finds herself facing a swordsman. . . .
Set in the author's hometown next to the Chesapeake Bay, this novelette (miniature novel) is the first tale in Swordsman in a Small Town, a diverse fantasy romance series about travel between small towns in parallel worlds. Essentially, what happened was that I had a fantasy series called The Three Lands, and I found myself wondering what would happen if a character from that world ended up in my hometown. It's a premise I've been playing around with in my head for decades – the idea of someone from an earlier fantasy culture having to cope with modern life. In this case, I added in a small town, a slowly growing romance, and the fact that my hero looks Middle Eastern, and I had my series. In the loosest sense, I was a writer from the moment I began telling stories as a small child. That was something every kid I knew did; we would play out the stories. I began writing down my stories when I was eight. By the time I was nine, I was toying with the idea of choosing writing as a career. To my supreme good fortune, when I was ten or eleven I read Jacqueline Jackson's Turn Not Pale, Beloved Snail: A Book about Writing Among Other Things. That book not only provided lots of helpful practical advice on being a writer; it also listed lots of reasons why one would want to be a writer. From the moment I read Turn Not Pale, Beloved Snail, I was a committed professional. I wouldn't begin writing fiction at a professional level for another twenty years or so, but I was fully committed to writing as much as possible and doing everything else I needed to become a published author. I learned how to find time to write during the quarter century that I was a full-time writer. For a couple of years there, I was bringing out an e-book every week – mainly reissues, but still, with a workload like that, you learn to be disciplined, which was a lesson I badly needed. My new day job – other than taking care of housework for me and my disabled apprentice, which is an important part of my day – is running a business called Historicalfic: Historical Research for Fiction Writers. I'd like to be a helping hand to authors who need assistance with their historical research. I've been doing historical research for thirty years now, not only as a novelist, but also as a journalist and history writer. My Muse is enamored with foreshadowing. My Muse does this by "backshadowing" – grabbing onto old, trivial references and making them important. For example, in Sweet Blood I was bringing in a new character. My Muse said, "Hey, remember three volumes back, when you mentioned a soldier in passing? And wait, couldn't this guy also be the soldier who briefly appears in the very first story of the series, which you wrote back in 2002?" I once tried to show a fellow writer, through colored type, where my Muse inserted foreshadows into a story I'd written. The story ended up looking as though colored confetti had been thrown upon it. From age nine onwards, a writer. It wasn't a strange choice. My father is a literary historian and printing historian; my mother was an amateur reporter and poet. They met while writing for their college newspaper. My parents were always very supportive of me becoming a writer, both in terms of emotional support and in terms of practical support. My father taught me how to do layout; my mother bought me my first thesaurus. Little things like that made all the difference. I enjoy diversity in fiction – both my fiction and other people's fiction. I have a tags page at my website for the diversities of character in my own stories. At my author accounts at Twitter and Facebook, I link to articles about diversity in fiction. Thanks for being here today, Dusk!